You can install a ceiling mounted garage furnace heater in your garage or workshop space that mounts to the ceiling where it is up and out of the way leaving valuable floor space for storage. The units come in both electric fueled models, and gas-fired models that require venting. We will cover both below and give you a basic idea of what is involved to get one of these up and running in your garage. The Qmark® model CDF542 electric forced-air heater shown at the left will heat over 400 square feet according to the manufacturer and is ideal for a small two-car garage or less. The unit is a ceiling mounted design that can be surface mounted or recessed, and requires a surface mounting sleeve that is an additional cost. When surface mounted, the unit extends only 6" into the room. This unit operates on 240V-AC and can be wired for single or three-phase power. The fan moves 283 cubic feet of air past the heating elements per minute. The frame sizes are 22-1/4" x 22-1/4" and can mount easily into a standard 2 x 2 ceiling grid for recessed applications. The Model CDF542 offers some nice safety and efficiency features with a thermal cutout that shuts the unit down in the event of overheating and reactivates when the heater temperature returns to normal. An optional thermostat can be mounted inside the heater that controls room temperature. When the thermostat calls for heat, the heating elements and fan energize. When the thermostat is satisfied, the elements shut off, but the fan continues to operate until all of the heated air is discharged. This feature avoids exposing the heater unit to residual heat, achieving a very high comfort level and longer component life. The Model CDF42 Garage Furnace Heater cover sleeve, shown at the right comes in a navajo white finish. The flush mount cover sleeve is available in a bright-white to match standard ceiling grid coloring and features adjustable air-flow patterns. The manufacturer states that the unit is easily installed by a single person. Your editor's recommend having a licensed electrician execute the wiring process, especially if you have three-phase power. If you don't have gas service available for your garage, the Qmark® Model CDF42 is an excellent choice for forced-air heating. This product has received a Five-Star review from a customer in Wildwood, Illinois and should retail at about $750.00 including the optional thermostat and the required surface mounting sleeve. The Modine Hot Dawg® gas-fired garage furnace heater shown at the left is one of the most versatile units on the market and your editor's highly recommend the product if you have gas service available for your garage. The unit is available in the 30,000 - 75,000 BTU range with 3" diameter venting required, and in the 100,000 - 125,000 BTU range with 4" diameter venting required. The unit comes standard with power-exhaust that simplifies side-wall or roof venting and features a permanently lubricated motor for trouble free dependability. The Hot Dawg® can be setup for both natural gas or propane and features a direct spark ignition. It's low-profile design works great in garage with only an 8' high ceiling. The smaller BTU units measure 26' x 12" x 16-1/2" and the larger BTU units (100,000 and up) measure 36" x 21" x 24". The smaller BTU units (30,000 - 75,000) are mounted with an included kit that contains angled hanging brackets designed for 3/8" diameter bolts, lag screws, or rods. This allows for a snug-to-ceiling installation with 1" clearance, or the unit can be suspended with threaded rods. The larger units do not include mounting brackets and can be mounted with 3/8" diameter threaded rods or 3/8" eye-bolts and chain. One of the best features your editor's have noticed is that the smaller BTU units can be flipped to allow left-or-right hand access to the controls. The gas, electrical and flue connections can be changed from one side to the other by simply flipping the Hot Dawg® over. The unit has a 1/2" diameter gas connection and required 110V-AC power. The louvers are adjustable to direct the heated-air where you want it. The smaller BTU units will heat up to a 3-1/2 car garage. The larger BTU units are for large garage-shop setups. 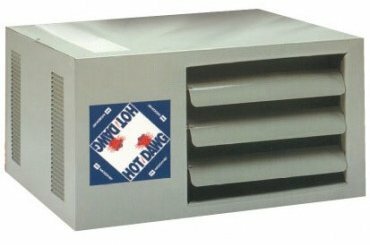 The Hot Dawg® garage furnace heater models retail between $525.00 to $785.00 depending on the BTU output and are one of the best values on the market for residential garages. The manufacturer recommends professional installation of the wiring setup, gas piping, and the initial use of the included service manuals. 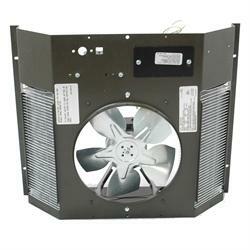 Most of the smaller units up to 45,000 BTU's are UPS shippable. All others are freight only.